A classic one room building, the Ash Creek school is a single story, rectangular (33′ x 22′) structure constructed of cut and coursed native sandstone. Masonry is somewhat crude. The front door is recessed behind an archway covered with a small porch. Wood sash windows, resting on concrete sills, reach to the eaves. 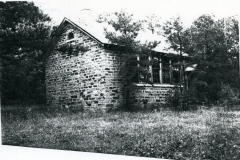 The school building is significant because it is one of the few one-room WPA constructed school houses that remains in good condition. It is also a good example of a structure built in the early days of the program, demonstrating crudeness of stone cutting and masonry. 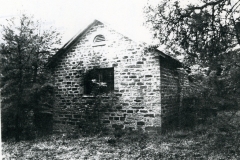 Construction of the school also provided work opportunities in a rural and remote area for destitute laborers who had suffered much because of the lack of economic security during the early years of the depression. And it is notable as well because the school district never owned the property upon which the building was constructed. Architecturally it is unique in the community because of its type, style, scale, materials and workmanship. VERBAL BOUNDARY DESCRIPTION: Follow state highway No. 2 northwest from Wilburton through Robber’s Cave State Park to the road that turns west to Lake Wayne Wallace, known locally as Ash Creek Road; then go west approximately two and one-half miles to a lane that leads to the property on the north side of the road, which begins at a point 1045 feet south and 836 feet west of the NE corner of Sec. 10, T 6 N, R 18 E, and runs 209 feet south, 209 feet west, 209 feet north and 209 feet east.